Imagine how rich life would be if you felt mentally clear, emotionally balanced, and spiritually inspired every day. How much good could you do if your body always felt strong? Where would you travel or who would you help if you had plenty of money? How grounded would you be if you had a conflict-free partner relationship that nourished you? Carol Tuttle, bestselling author of Remembering Wholeness, has found that a truly affluent life is rich in 6 areas: spiritual, mental, emotional, physical, financial, and in relationships. 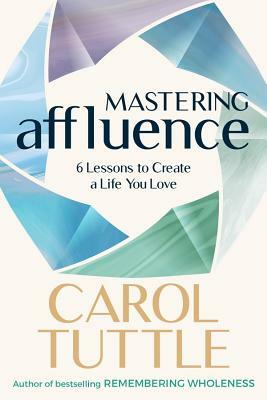 In her newest book, Mastering Affluence, she guides readers through 6 simple lessons (one for each area) to clear away longstanding patterns of struggle and replace them with ease and joy. Mastering Affluence doesn t just help its readers feel optimistic about having a better life. It guides them through a personal process to actively create one. Readers who follow Carol Tuttle's 6 Lessons and complete the activities throughout will come to the end of this book w.